When NASCAR visits its shortest tracks like Bristol Motor Speedway’s half mile, credit for a good save usually can’t go to just one driver—everyone’s so close to each other that a save is a team effort. That’s what happened when Kyle Larson wrecked from the lead Monday, and a huge chunk of the field had to dodge him. 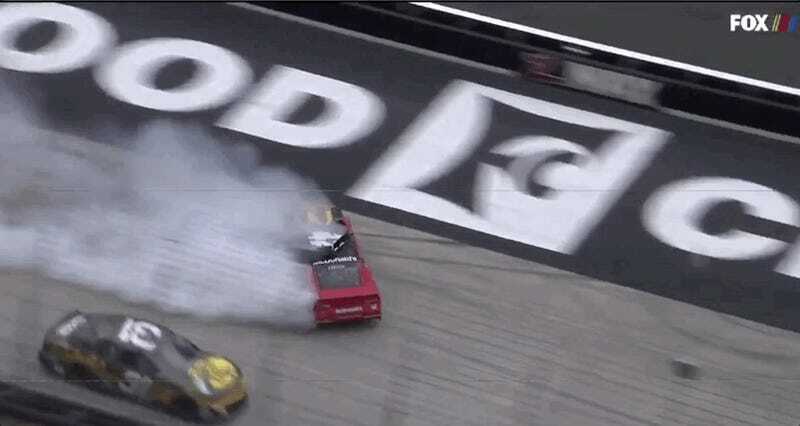 This rain-delayed Monster Energy NASCAR Cup Series race at Bristol hasn’t been good to its leaders, since Ryan Blaney wrecked from the lead on Sunday and Larson did the same once the race got back going on Monday. Both were dominant, and both went wrecking from the top spot. Larson didn’t suffer the usual effects of spinning himself because he didn’t hit anything or anyone, and he restarted the race third behind Kyle Busch and Brad Keselowski after the caution flag he brought out. He dropped to sixth on the first lap after the restart and seventh later on with 165 laps to go, saying he had a left-rear tire rub. That would make sense, since that’s where he hit Newman. But just over 100 laps later, Larson got past all of those cars and back into the lead. He was dominant, stretching the lead about by six seconds with 30 laps to go, before a restart that let Busch pass him for the win. That’s how dominant the car was, spin or not. Larson’s late spin would’ve been the save of the race had he won it, and he would’ve had everyone but himself to thank for it.